Our completed framed guidons are shipped free of charge to the lower 48 or the (48 contiguous United States) via FedEx Ground Service. We have found their service to be the most reliable and timely, with the best record of handling without breakage. All shipments are insured by us and require a destination where a delivery signature can be obtained. We also offer local pickup from our retail location, Cindy’s Custom Framing & Antique Art, Inc, located at 10070 Ford Avenue, Richmond Hill, GA, 31324. If you prefer to make a local pickup, we can substitute 99% UV protected glass for the 99% UV protected acrylic that is part of the standard package. 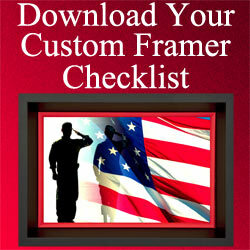 Otherwise, all shipments include 99% UV protected acrylic glazing as part of the framing package. If you desire to make the substitution and make the local pickup, please contact us as soon as your order is placed at 912-756-2781. 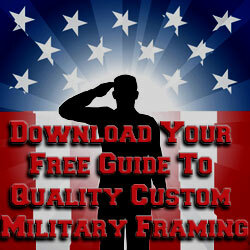 Shipments to Alaska And Hawaii require special handling and shipping and are not shipped free. If you wish to receive a shipment in Alaska or Hawaii, please contact us in order for us to calculate the shipping and handling cost. Shipments to Alaska and Hawaii require you to contact us once the order is placed.